(Newser) – A California woman is publicly shaming her 36-year-old son by sharing the embarrassing photos he took with a rattlesnake—right before it bit him—with local news stations. 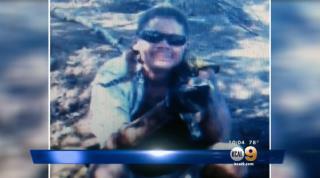 Deborah Gomez tells CBS Los Angeles she's trying to teach her son Alex a lesson. KTLA reports Alex Gomez found the 4-foot-long snake behind his family's ranch Monday and started posing for photos with it, even going so far as to wrap it around his neck. That's when the snake bit Gomez's hand, likely not a moment too soon from the snake's perspective. "I was going to take it off my neck and do something else with it," Gomez tells KTLA. I hope the poor snake doesn't get infected with his stupid. The poor rattler just decided to try to thin the herd. Has anyone checked the snake? To see if it has stopped laughing.